Make receiving your diploma a ceremony, not a formality! Graduation is an opportunity to celebrate – make this day amazing! For more than 15 years, we have been keeping this day for graduates as a special one. We offer academic gowns, graduation caps and professional photo service. We provide our service in whole Poland. In order to make it as easy as possible for you to organize such a ceremony, we deliver your gowns and grad-caps to the ceremony place. 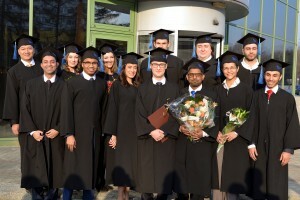 You don’t have to worry aboute sizes – we dress graduates with proper sizes by ourself. Grad-caps are universal. We can also ship you gowns and grad-caps by carrier if the group is not numerous. We provide classic black gowns for hire. Many years of experience, hundreds of successful celebrations and a large number of gowns, allows us to handle every event in Poland. Just order our arrival. Caps are made of high quality fabric, have a stiff upper part and a year A.D. 2017 placed on the tassel. You can order any colour of the cap and the tassel. We also offer making a high-quality embroidery – logo, name of univeristy, faculty, graduate name. Caps have a universal size. 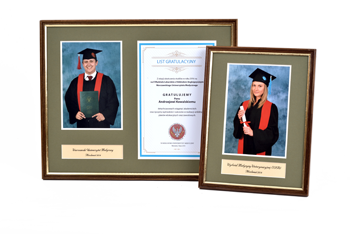 We provide a professional mobile photo studio for graduates to let them order a graduation photo-frame with their portrait. We offer prestigious frames with a portrait photography, embedded in a 3D passepartout, a school name plate and a congratulatory letter. Such memorabilia are great for decorating a room, office, as a gift for parents, etc. You can also order a high resolution portrait photography as digital version (an option without the frame). The best Polish univeristies trusted us!